While it is often claimed that users are more and more empowered via online technologies [4, 16, 17, 31], the counterpart of privacy dis-empowerment is more than a suspicion . From a human-computer interaction perspective, the following have previously been observed (1) users still fail to use privacy technologies on a large scale; (2) a number of human-computer interaction mismatches exist that impact the use of privacy technologies [1, 5, 6, 15, 22, 32]; and (3) the user affect dimension of privacy is fear focused . This paper reports on a experts’ perspectives on empowering users towards privacy. We facilitated a workshop with \(N=12\) inter-disciplinary privacy experts to gather opinions and discuss empowering case-studies We reviewed literature focusing on the empowering versus dis-empowering impact of online technologies, and looked into psychological empowerment and usable privacy research. The workshop participants pointed to a state of privacy dis-empowerment online, with human-computer interaction and business models as major themes. While it was clear that there is no clear-cut solution, supporting clearer communication channels was key to experts’ mental models of empowered privacy online. They recommended enabling user understanding, not only for privacy threats but also in using privacy technologies and building user skills. To facilitate user interaction with complex secure communication tools, they suggested a transparency enhancing tool as a bridge between the user and encryption technology. The outcome of the workshop and our review support the need for an approach that enables the human user, as well as their interactions and their active participation. For that we postulate the application of psychological empowerment . 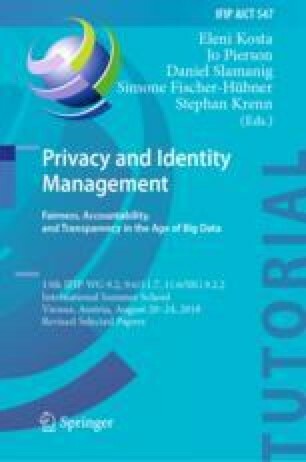 To our knowledge, this paper provides the first known discussion among inter-disciplinary privacy experts on the topic of privacy dis-empowerment online, as well as the first categorisation of HCI mismatches impacting the use of privacy technologies.